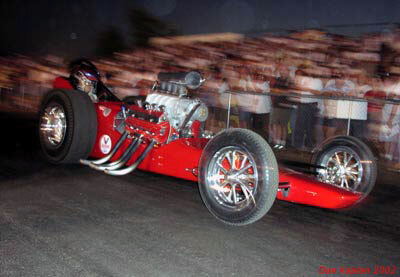 The 1961 Ernie's Camera "Shudder Bug", a rare Pontiac Top Fueler (originally built to be a gas dragster), is famous for its extremely short wheelbase (92 inches) and Kent Fuller full-bodied chassis. 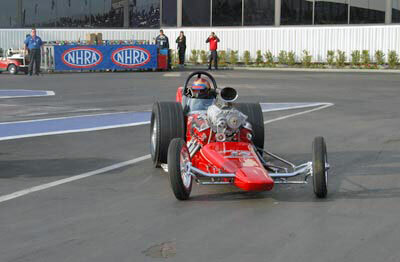 It was also the first dragster to have the "hooped" or rounded roll cage opposed to the square designs that were the previous standard. 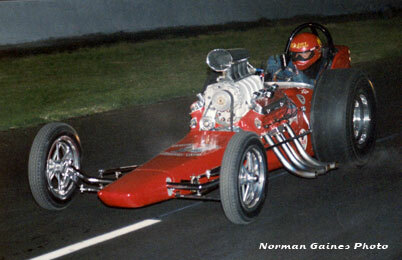 Lions, 1961 with Bill Alexander driving on it's very first first outing running a the Pontiac on gas. 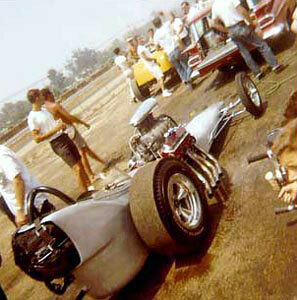 Taken in May of 1961, this was the cars first outing with the full body and on nitro when Tommy Ivo was driving. 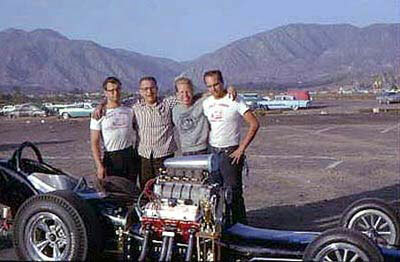 Tommy Ivo and the Ernie's crew in 1961 with its short lived black paint scheme. 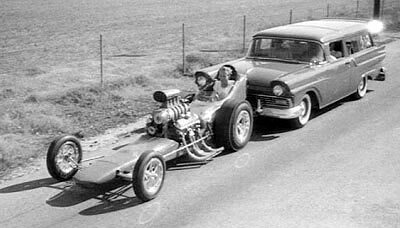 This is a very rare shot of "TV Tommy" Ivo in the car in 1961. 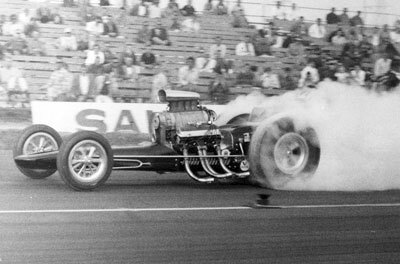 Although Ivo did the shake down runs on the car, Bill Alexander took over in 1962 until its demise in a crash in late 1963. 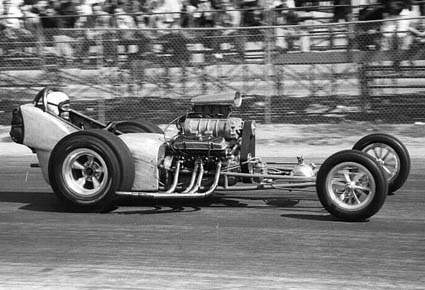 A rare color shot of the car at Bakersfield, March, 1963. 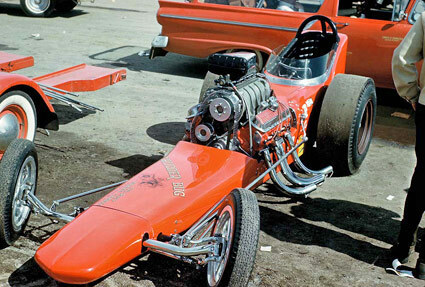 Arguably the best color shot in existence of the car taken at Bakersfield in 1963. 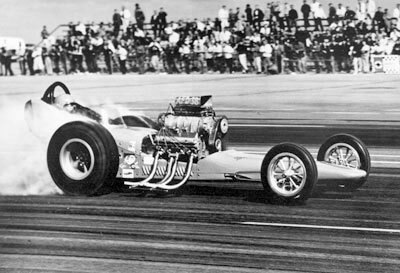 Long Beach in 1962. 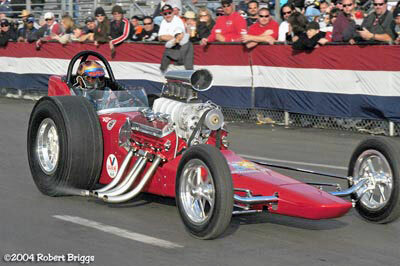 "Wild Bill" Alexander is out first on Don Prudhomme, and that is how he won. 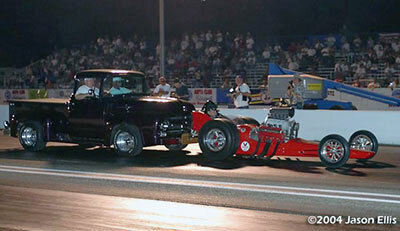 This was the final round of a 32 car show. 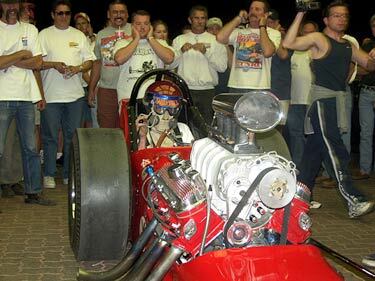 What makes it a piece of history is that it was the first win for Ernie's Camera, on fuel. 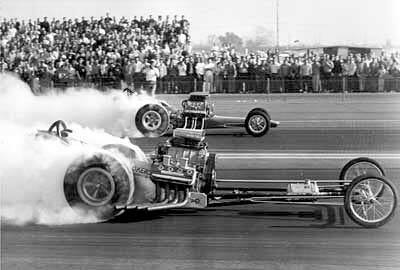 It was also one of the seven times that the Greer, Black, and Prudhomme, was ever beaten. 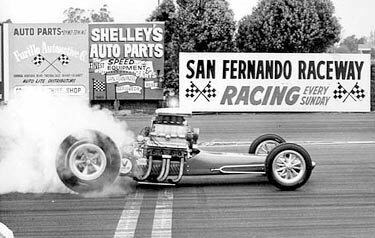 A very rare shot from the files of the LA Times newspaper using the Ernies Camera car for an ad for San Fernando Raceway circa 1962. 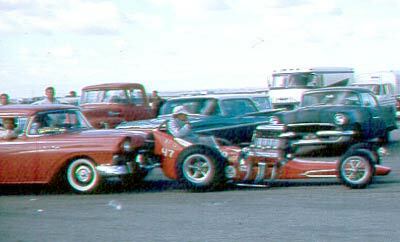 "Wild Bill" Alexander in (red trim) in 1963. 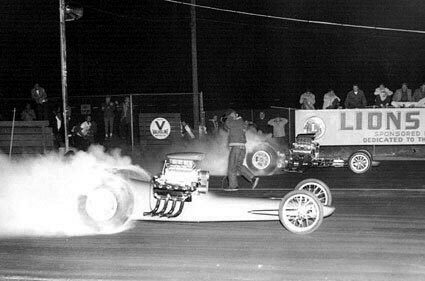 Ironically Alexander (far side) paired off with original driver "TV" Tommy Ivo at Pomona in 1963. 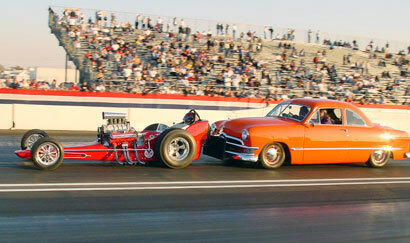 Alexander won. 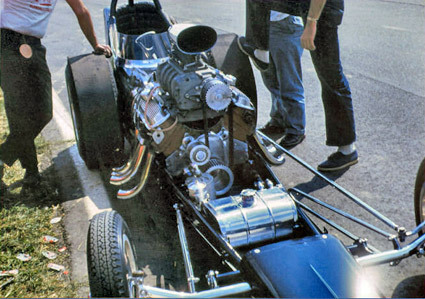 The car ready to load up for the long trip to the US Nationals at Indy in 1963. 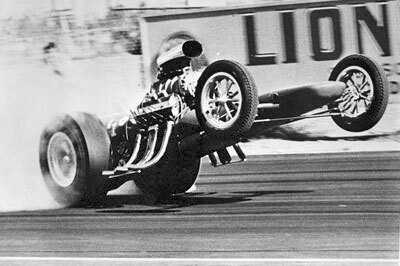 Taken shortly before the car was destroyed in a crash in late 1963 landing Alexander in the hospital for seven months. 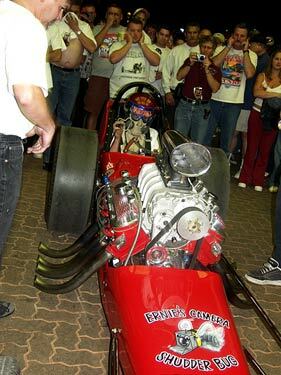 In 2002 Cacklefest officially kicked off Friday night at the Double Tree Hotel with the debut of the recreated Ernie's Camera 1961 "Shudder Bug" fueler. 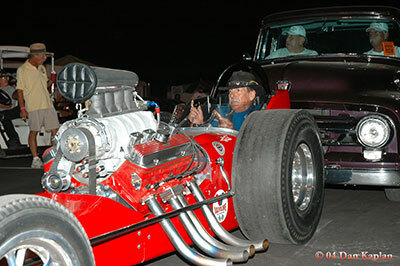 Rod and dad Bill Alexander (the original driver) did an incredible job of bringing this car back to life. 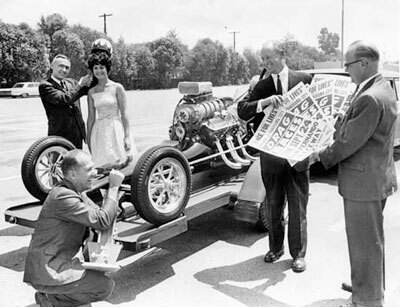 Although the original car was completely destroyed in the 1963 crash, the Pontiac engine survived and sat in Alexander's garage for almost 40 years only to be freshened up an installed in the reproduction. 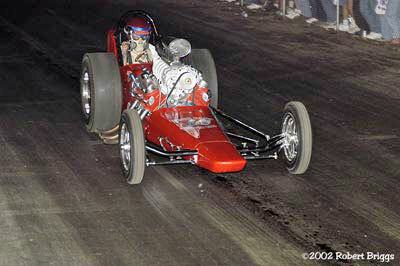 Original driver Bill Alexander in the seat at the Double Tree Hotel. 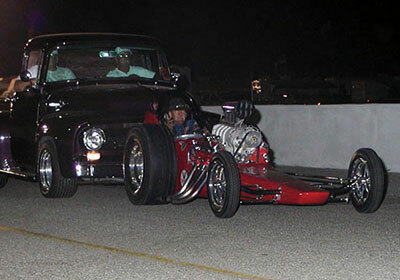 The next night the car does what it was born to do... push start and cackle. 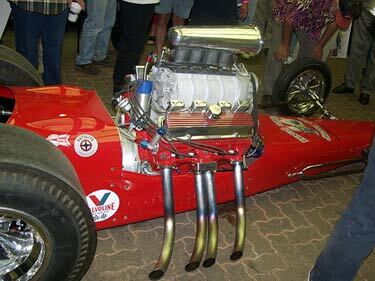 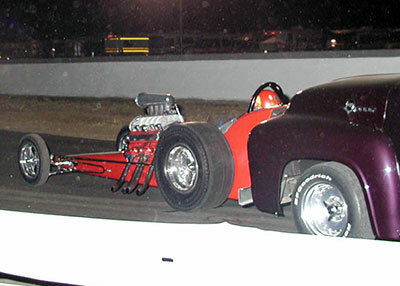 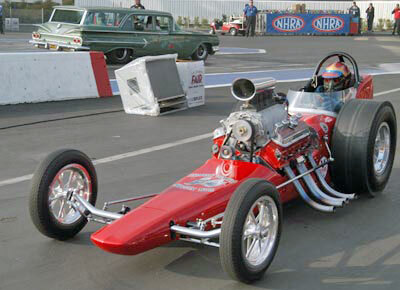 At the 2003 NHRA Winternationals at Pomona the car was featured in a Big Show Cacklefest.